Apple' iTunes is reaching its 25 millionth mark for the downloaded apps. To celebrate this momentous event, they have organized a contest wherein you can enter with or without a purchase. The contest is open to everyone even outside the United States. Fill up the form at http://www.apple.com/itunes/25-billion-app-countdown/entry-form/ and hope to win the US$10,000 App Store Gift Card. 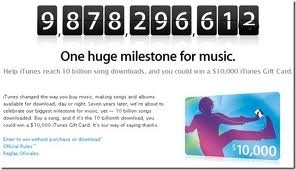 Contest ends when it reached the 25 billion mark. You can submit a maximum of 25 entries a day.